We were delighted to see not one, but two, of our clients featured in Country and Town House magazine’s roundup of the ‘10 Best Cookery Courses in the UK & Ireland’: The Avenue Cookery School in Wandsworth and The Raymond Blanc Cookery School at Le Manoir Aux Quat’ Saisons, Oxfordshire. “As a fast-paced cookery school, The Pure H2O Company’s Quatreau Tap has made a real difference to our day-to-day running of the school. The purity of the water is perfect for allowing the flavours of food to shine, while the Boiling function is great for making teas and coffees for our students without having to boil endless kettles! From blanching veg to making ice-cold sparkling drinks, our Pure H20 Quatreau is the icing on the cake for our busy cookery school.” – Richard Horsford, Chef and Teacher. We send our congratulations to the teams at The Avenue Cookery School in Wandsworth and The Raymond Blanc Cookery School at Le Manoir Aux Quat’ Saisons, Oxfordshire. Of course, pure water and multifunction taps are not just for cookery schools, hotels or restaurants. They’re ideal for everyday domestic use, too. Compact and convenient, our purifiers are typically installed under the kitchen sink and our Quatreau Touch replaces your kitchen tap or can be installed as an additional tap, as you prefer. And if you prefer drinking sparkling water, we have the perfect solution – either our original multifunction touchscreen kitchen tap the Quatreau Touch or our new compact drinks station the Quatreau SmartTap. Both deliver sparkling and chilled water, either filtered or pure, and can be installed at home, in the workplace or hospitality venue. What has been suspected for years has now been confirmed: the presence of nitrates in drinking water increases the risk of developing a common form of cancer, even at rates below the current ‘safe’ levels set by the World Health Organisation and followed by the UK Drinking Water Inspectorate. Researchers at Aarhus University in Denmark carried out the largest epidemiological study of its kind (1) and found a positive correlation between long-term exposure to nitrates in drinking water and the development of colorectal cancer, one of the most common cancers in Denmark and the most frequently occurring, worldwide. “huge quantities of slurry and poultry manure are spread on farmland and… the rules and guidelines governing how this should be done are invariably broken”. (3). Excessive levels of nitrates negatively impact the health of rivers and streams; they cause unchecked algae growth, which depletes the water of oxygen and makes the reproduction and survival of fish, aquatic insects, wildlife and plants difficult or impossible. (4) The risk to human health occurs because once entering the body, excessive nitrate levels interact with normally occurring amines and amides and convert into carcinogenic N -nitroso compounds. The World Health Organisation recommends nitrate levels of 50 mg per litre of drinking water, a standard that Denmark, EU countries and the UK authorities follow. Problematically, the Aarhus study found that colorectal cancer risks are associated with “concentrations far below the current drinking water standard”(5); in people exposed to the highest concentrations found in the study (9.3 mg per litre water) a 15% greater risk of developing colorectal cancer was identified, compared to those exposed to the lowest concentrations found (1.3 mg per litre water). “the drinking water standard ought to be lower in order to protect against chronic health effects” (7). Clearly, current drinking water standards are not safe. But you don’t need to wait for the World Health Organisation and UK water regulators to take action, you can protect your health today by installing a Pure H2O tap water purifier in your home, workplace or venue. Our technologically advanced reverse osmosis (RO) tap water purifiers remove up to 70% of nitrates and, when coupled with de-ionisation, our RODI water purification systems remove 99.99% of naturally occurring impurities and man-made contaminants including microplastics, hormones and medications, petrochemicals, lead and heavy metals. Our RODI purifiers also remove 100% of disease-causing micro-organisms, pathogens and viruses or your complete peace of mind. Our drinking water purification systems not only protect your health, they are also an environmentally friendly option. Compared to drinking bottled water, our purifiers reduce plastics use and waste, carbon footprint, food miles and save you money, too. 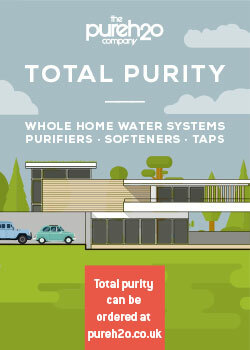 Pure H2O purifiers last longer than others on the market, they are water efficient and contain recyclable components. Our purifiers are designed specifically for treating UK water whether from public supply (tap water) or private water supply (bore holes, wells, etc). Quatreau Kitchen Taps: dispensing only what you need, in an instant. There’s no need to waste water whilst you keep your ‘cold’ tap running until it gets cold enough for a refreshing drink, either — just select the Chilled option on Quatreau Touch or Quatreau SmartTap for instant, efficient chilled water. If the environmental impact of single-use plastic pollution wasn’t enough to convince you that bottled water is a poor choice of drinking water, the latest news that plastic fibres contaminate over 90% of bottled water brands might be the final piece of information you need. Either of our 3 models remove microplastics and other man-made as well as naturally occurring impurities. They’re convenient and compact, fitting under a kitchen sink. They’re environmentally-friendly, too; reducing food miles, carbon footprint and single-use plastic pollution compared to bottled water. They’re also budget-friendly, starting at only £29 per month with our rental option (you can also buy outright). Industry specialist for over 15 years, Kevin Winchester – formerly of Brita Vivreau and Zip Water – has joined The Pure H2O Company (www.pureh2o.co.uk) the leading British manufacturer of water purification systems and the Quatreau Touch™ and Quatreau SmartTap™ which deliver boiling, chilled and sparkling water, as Sales Director. Enter your email address to follow Pure H2O News and receive notifications of new posts by email.